Diptyque will introduce La Collection 34, a new "permanent collection of ephemeral products". 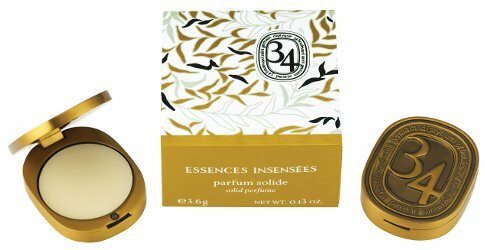 La Collection 34 will include home and personal fragrance as well as related objects; the 2014 edition includes Essences Insensées, the first in a projected series of limited edition fragrances. This edition of Essences Insensées starts out cool, and is slightly spiced-up by graceful violet and a touch of pink pepper. Heliotrope and Provence rose enhance the naturalness of the mimosa flower that is gradually softened by vanilla, maté and beeswax. To turn this unique fragrance into a perfume, a unique bottle also had to be found. To this end, diptyque patiently embarked on a treasure hunt that led to the archives of a master glassmaker, one of the last in France to work traditionally by hand, the century-old company Waltersperger. Sifting through hundreds of shapes, the perfect bottle was finally found. Elegant, timeless and engraved with a pattern of leaves and flowers unquestionably reminiscent of mimosas! Diptyque Essences Insensées will be available in 100 ml Eau de Parfum and 3.6 g Solid Perfume. Not sure that the scent is grabbing me so much, but that bottle is gorgeous. I like the solid design as well – the regular black ones are nice and hefty, which I quite like – feels luxurious. I like the bottle very much, but hate bulb atomizers…hope it’s optional. And hate the 100 ml size! A “permanent collection of ephemeral products”? Aqua Allegoria, anyone? Well, many of those have been around for years. I think this is more like a series of limited editions, a new one every year? They imply they’ll keep using the same name. But I could be wrong, of course. I’d like to sniff this one. I’m sure that the price will be absurdly high. Could be. Hope it’s not like the L’Artisan harvest things.